I see the little boy who would get so angry that he wouldn’t be understood – but I need to blink him away. The real boy is up on stage projecting his voice so that the whole hall can hear him. I see the little boy who would be too shy to socialise – but he’s grown. He’s leaving pauses in the speech so that the audience can laugh. A confident, perfectly timed arched eyebrow knowing he’ll get a response. We’ve worked with him for over 8 years on his speech. While I was worrying about each little milestone, I didn’t realise that underneath it all we were growing a confident communicator. He still has a lisp. Not all his sounds are consistent. But I’m the only one that hears that now. Everyone else saw the young thespian loving every moment on stage. I need to make an effort to see that too. I remember the little boy – but I see the big boy too – and I will take a moment to be so proud of all of us for leveraging a weakness into a talent. An idiosyncrasy of Junior’s speech is that she doesn’t use gender identifying pronouns correctly. He/she her/his all come out interchangeably. It never really bothered me that much, because it was easy enough to understand what she meant. However, I’ve now decided to make a project of it. I’m hoping it will be relatively easy to fix, and make her speech sound more natural to people who don’t know her so well. 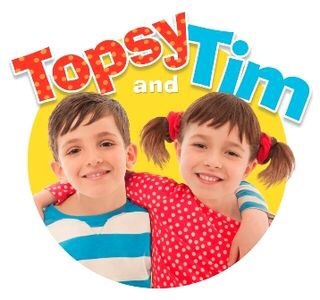 My allies in this are Topsy and Tim – the boy-girl twin starts of the CBeebies show with the same name. There is nothing in the show itself about pronouns, but we acquired the tie in magazine, and we’ve been playing with the toys and activities. A simple thing that’s worked really well is for me to say something about Tim (He has brown eyes) and then ask Junior to tell me the same thing about Topsy (She has brown eyes). And on and on on any theme or storyline you like, keeping the echo going to constantly compare and contrast the male and female pronouns. What helps a lot is that Junior is starting to read. We cut out the biggest pictures of Topsy and Tim from the magazine and wrote ‘She’ and ‘Her’ on Topsy’s tummy and ‘He’ and ‘His’ on Tim’s tummy. This improved her accuracy a lot. And a nice side benefit that her teacher thinks we’ve been super diligent teaching her sight words. Take the praise where you can get it! Cutting up the kids’ food. A little parenting habit that you internalise. Then one day you’re at a work lunch and you only just stop yourself leaning across and offering to slice up your colleague’s chicken. Here’s another habit that I’ve absorbed – to build up my kids speech. Echo their sentences back adding a word. A therapist taught it to me when Junior was at two word sentence level and we wanted her to move on to three word sentences. I find it works for all stages. I think it helps gently nudge the kids towards more complicated sentence structures. More than that – it always makes me feel happier in myself – because it is a speech booster that is achievable on even the most stressful days. I’m setting myself a challenge: echo and add ten times for ten consecutive days. I’ll report back.